Many users face difficulties for copying data such as photos from iPhone to other devices. The problem gets more complicated when the other device uses other operating system such as Windows or Android. Here we provide safe and secure methods to transfer photos from iPhone to other devices like Windows or Mac OS X computers, Android or other iOS devices. The following methods include easy steps to transfer photos without iTunes. In case, for any reason, using iTunes isn’t possible, Wondershare TunesGo is one of the top options for copying pictures and photos from iPhone to Windows or OS X powered computer. Just download and install TunesGo application from Wondershare website. The software is compatible with both Mac OS and Win systems. On PC (the process for Mac is very similar), run TunesGo program. Then, using the Apple USB cable, connect iPhone to the computer. Below picture is how the interface would look like. From the top panel of the software, select the option for ‘Photos’. Now, all albums such as Photo Library, Camera Roll and other photo albums included in the directory for photos will be shown on the screen. ‘Export to PC’ from ‘Export’ options from below the panel should be clicked. Of course, this should be done after needed photos to be copied are selected. Data transferring should begin after the destination folder is browsed and confirmed by user. 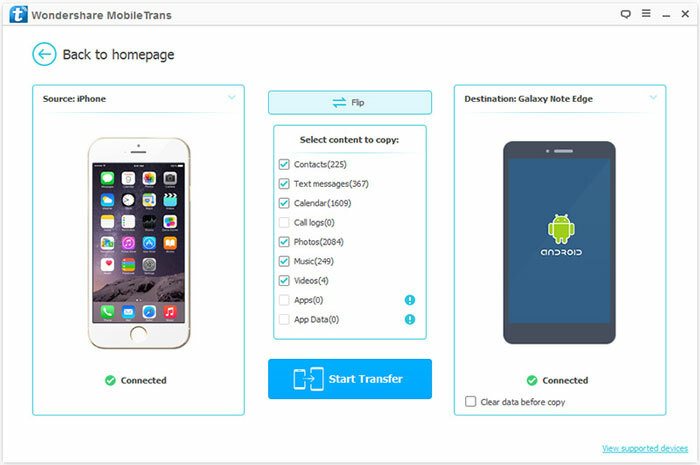 One of the easiest methods to perform the iPhone to Android/iOS transfer is using MobileTrans by Wondershare. In fact the phone to phone transfer option provided by this program is way beyond just from iPhone to another phone. Most mobile OS (e.g. Symbian, BlackBerry, Android, etc.) and brands (e.g. HTC, HUAWEI, Motorola, Samsung, etc.) are compatible with this phone transfer software. iPhone 7 Plus, iPhone 7, iPhone 6, iPhone 6s, iPhone SE, iPad Air, iPad Pro & iPad Mini are among the supported iOS devices for MobileTrans software. 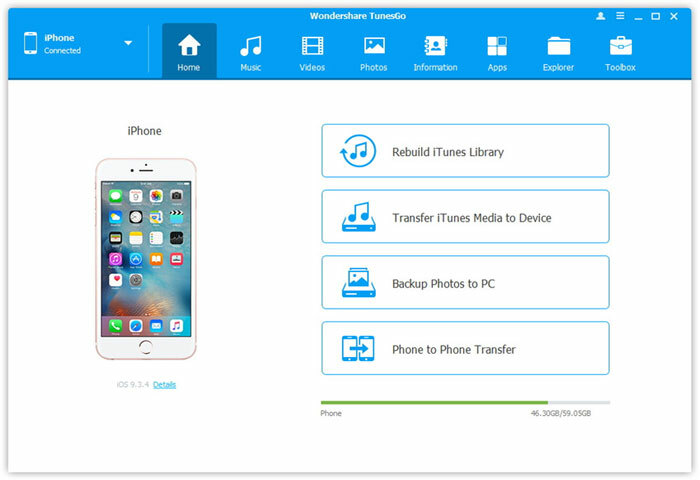 After the installation process is complete for Wondershare MobileTrans, or if it is has been downloaded and installed before, just run the program on Mac OS X or Windows system. Now is the time to connect the mobile devices (Android and iPhone) to the computer using USB cables. The application’s window would show the devices as soon as they’re detected by the system. Please note that they should be kept connected to the computer until the copying process is complete. Otherwise, the transfer might not be executed correctly or some files and images could be missed. As it is shown in the picture, there is an option labeled ‘Clear data before copy’. This is used to clear Android device from useless data and files so that more storage space would be available on the phone or tablet. Check it if necessary. Click ‘Start Transfer’ after required data to be copied is checked from the available content on iPhone. Please note that similar steps could be taken for iPhone to iPhone transferring process. Moreover, as it is obvious, besides photos and pictures, other types of data such as video, music, calendar, messages and contacts could be transferred between smartphones as well. 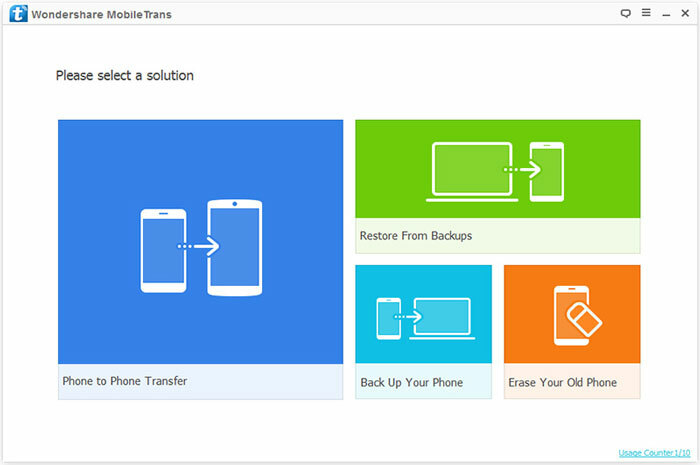 In addition to transferring capabilities, other features such as data backup/restore and phone data deletion are offered by MobileTrans program. 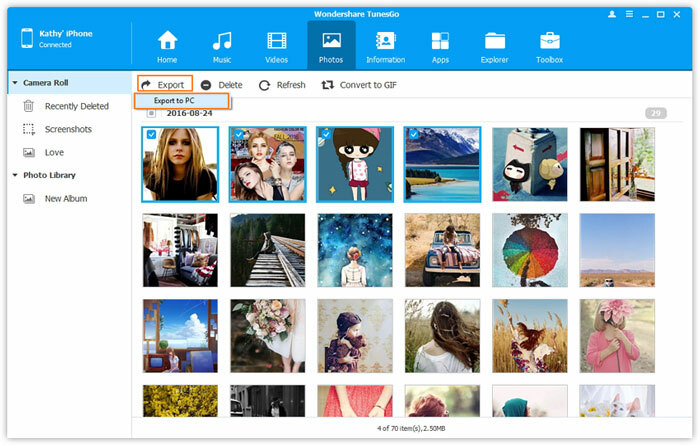 Wondershare TunesGo has photo transferring options too, but the supported devices are limited to Android and iOS.